IWAKUNI, Japan - Carrier Airborne Early Warning Squadron (VAW) 125 arrived at Marine Corps Air Station (MCAS) Iwakuni, Feb. 2. The "Tigertails" of VAW-125 are relieving the "Liberty Bells" of VAW-115 as the early-warning squadron of the U.S. Navy's Carrier Air Wing (CVW) 5, supporting the Ronald Reagan (CVN 76) Carrier Strike Group. "We are excited to join the forward-deployed naval forces at Marine Corps Air Station Iwakuni in the amazing city of Iwakuni," said Cmdr. Daniel Prochazka, VAW-125's commanding officer. "I would like to thank the city for its hospitality and for warmly welcoming us to this incredible place. This is my second time in the forward-deployed naval forces. My fond memories make me personally very thrilled to be back." 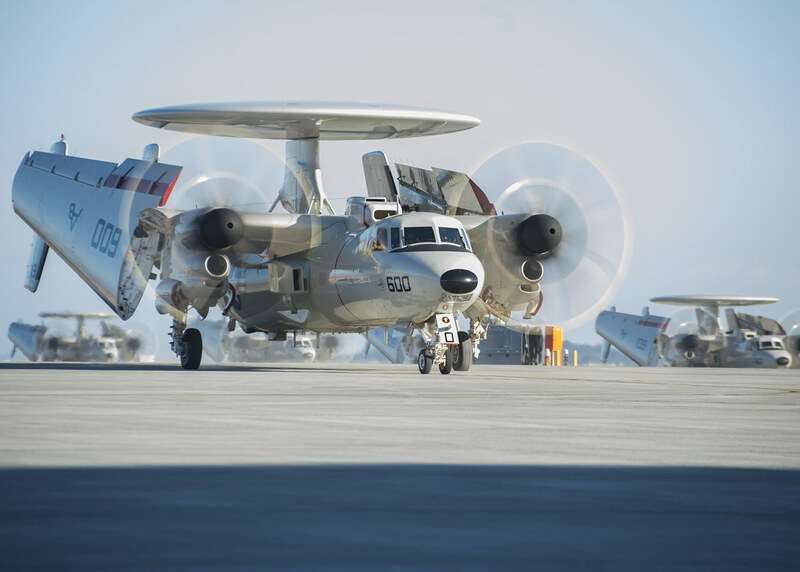 VAW-125's arrival also brings enhanced capabilities to the region, as the squadron's five E2-D Advanced Hawkeye aircraft provide substantial upgrades over the E2-C Hawkeye platform. VAW-125 is the U.S. Navy's first operational fleet squadron to utilize the E2-D.
"VAW-125 is the first and most experienced E-2D squadron in the U.S. Navy," Prochazka said. "This aircraft has the most advanced airborne radar in the world, and the people who fix and fly it are the best in the U.S. Navy." Among the improvements in the E2-D are an all-new electronics suite, enhanced turboprop engines, modernized communications, and upgrade potential for mid-air refueling capabilities. The U.S. Navy first took delivery of the E2-D July 2010, and began a phased replacement of the venerable E2-C aircraft which has served the fleet since 1973. Prochazka added the forward deployment of VAW-125 to MCAS Iwakuni is in accordance with the U.S. Navy's strategic vision for rebalance to the Indo-Asia-Pacific region, putting the most advanced and capable units forward in order to support the United States' commitment to the defense of Japan and the security and stability of the region. "I am proud to bring the E2-D Advanced Hawkeye to Japan and to help strengthen the alliance between our two great nations," he said. "I am confident that our people and equipment will continue to build upon the vital relationship between our two countries."